A simple, very tasty Okra dish. I harvested some okras from my garden pots and found a recipe in this lovely book of Cathy Erway's, Food Of Taiwan, to use up those lovely okras. This dish is best made with tender fresh okra. According to the author, instead of okra, crisp green beans can be used instead. 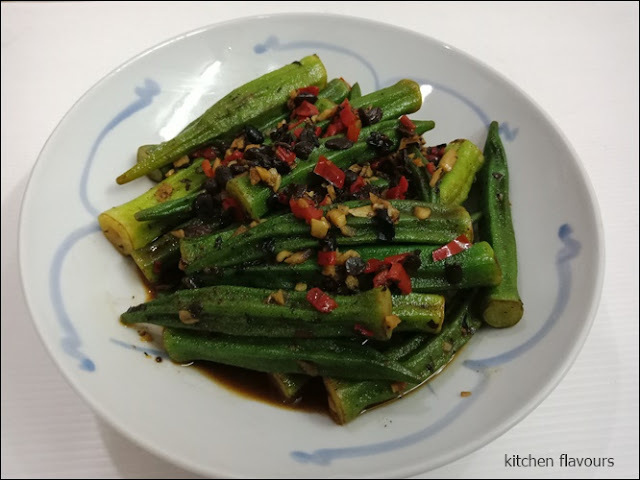 Very easy and quick stir-fry okra dish, and it is very tasty. A definite repeat! Heat the oil in a large skillet or wok with a lid over medium-high heat. Add the garlic and chillies and cook, stirring, just until fragrant, about 1 minute. Add the okra pods along with a pinch of salt and cook, stirring occasionally, until their colour just deepens, about 30 seconds. Stir in the black beans, Add the water and bring just to a boil. Cover and cook until the okra is tender, 3 to 4 minutes. (Taste the okra to test for doneness). Season with additional salt if desired and serve immediately. The three cup as in the name of the recipe is originally from one cup each of sesame oil, soy sauce, and rice wine. 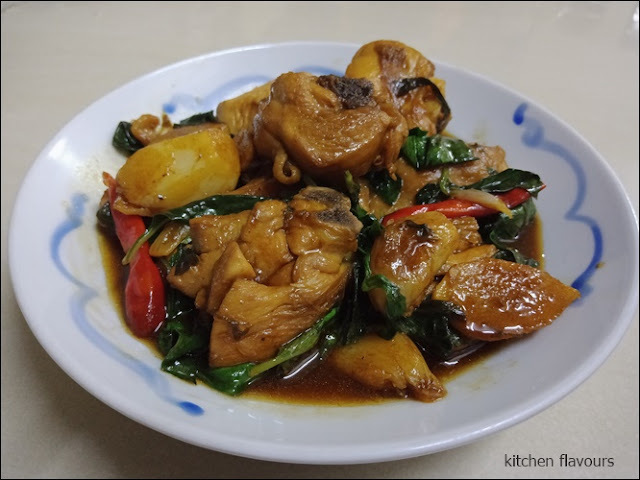 This savoury dish is very tasty with the flavours from the amount of garlic used, as well as the use of Thai basil leaves which gives this dish a very different taste from other braised dishes. I however, did not use 1 cup of soy sauce as the recipe indicated. I thought that it will be extremely salty even though the soy sauce I use in my kitchen is the less salty ones. I use only 1/4 cup and thought that this dish is pretty salty! I have also used less sesame oil, but I did use 1 cup of rice wine. The dish turns out pretty tasty, only slightly salty but goes great with white hot fluffy rice. Do not omit the basil leaves, as the unique taste of the dish comes from the basil leaves which contributes both the taste and fragrant of the final dish. Heat the oil in a large skillet or wok over medium-high heat. Add the ginger, garlic, scallions, and chillies, and cook until just fragrant, about 1 minute. Add the chicken pieces and lightly brown, stirring occasionally, 2 to 3 minutes. Add the rice wine and soy sauce and bring to a boil. Reduce the heat to a simmer and cook, uncovered, until the chicken pieces are cooked through and the sauce has slightly reduced, about 15 minutes. Stir in the sugar until just dissolved. Remove from the heat and stir in the basil. Serve immediately. Bitter melon or bitter gourd is an acquired taste, either you love it or you hate it. In my house we love bitter melon except for my daughter, who does not like the bitter taste of the melon. Bitter melon is sliced to about 1/2 inch thickness, remove the seeds and white pith in the centre, then blanched in salted water for 2 to 3 minutes, drain, let cool a little and stuffed with pork-dumpling style filling. Place on steaming tray and steam over high heat for 10 minutes or until the filling is cooked through. These are for my daughter, made with Fuzzy Melon or also known as Hairy Gourd, and it works well too. 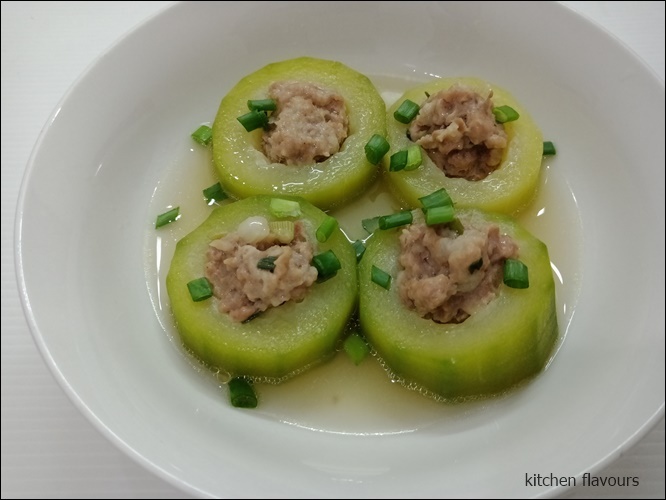 Both the stuffed bitter melon and fuzzy melon dish are very tasty. In a large bowl, combine the pork, scallions, soy sauce, oil, cornstarch, salt, and white pepper. You can do this up to a day ahead and store, covered, in the refrigerator. Trim the ends from the melons and slice into rounds about 1/2-inch thick. Entirely scoop out the seed pockets from the centres of the slices. Bring a large pot of salted water to a boil and submerge the slices. Blanch for 2 to 3 minutes, then drain. Arrange the melon slices on a flat plate that fits inside a steamer (or directly onto a bamboo steamer rack lined with parchment paper). Fill each centre completely with a scoop of the filling mixture. Steam until the filling feels firm to the touch and is entirely cooked through, 8 to 10 minutes. Transfer carefully to a deep serving dish. If desired, lade the stock in a shallow pool at the bottom of the dish for serving. A simple flavourful dish, what we would call, an "everyday dish". Best eaten with fluffy rice and great with plain congee too. The brinjals I used are from my garden pot, harvested when the brinjals are young and tender. I pan-fry the pieces of brinjals cut into batons, in a little oil on both sides. The sauce is then cooked and the brinjals are stirred in for a few minutes until the sauce thickens. Come and join us at Cookbook Countdown. This month we are cooking Chinese Cuisine. Cook any Chinese dishes, desserts, or refreshments and link with us at CC. You are welcome to link any other recipes, not necessarily Chinese dishes. As long as you are using any of your cookbooks, you are good to go! More details at CC. One of my favourite cookbook on Chinese cooking is Every Grain of Rice by Fuchsia Dunlop. The recipes are simple and doable for the home cooks. This Sweet-and-Sour Spare Ribs recipe is similar to our local Pai Kuat Wong (directly translated as King Spare Ribs), with sticky sweet and sour glaze and tender meat. It is always one of the favourite dish to order when eating out at Chinese restaurants. This dish takes a few extra steps to make. You would want to get the meaty spare ribs for this dish. The spare ribs are first boiled in water with a few ingredients, then remove, drain and deep-fried until golden. The ribs are then cooked in the sweet-sour sauce until the sauce thickens and the ribs are coated with the sticky sauce. 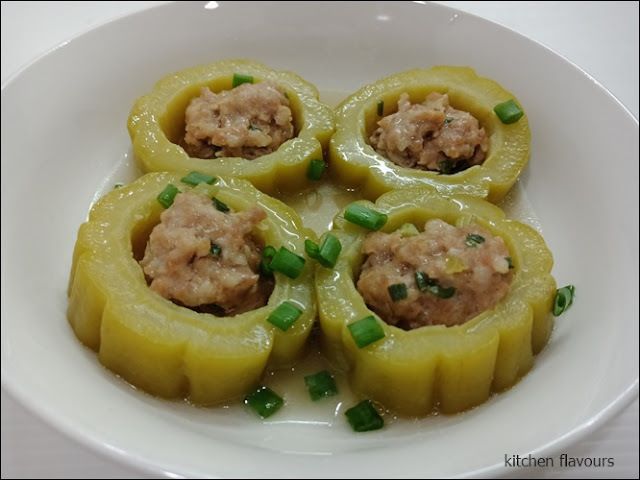 According to the author, this dish is served as an appetizer in many parts of China, though over here, it is usually served as part of a meal with rice. Delicious dish!